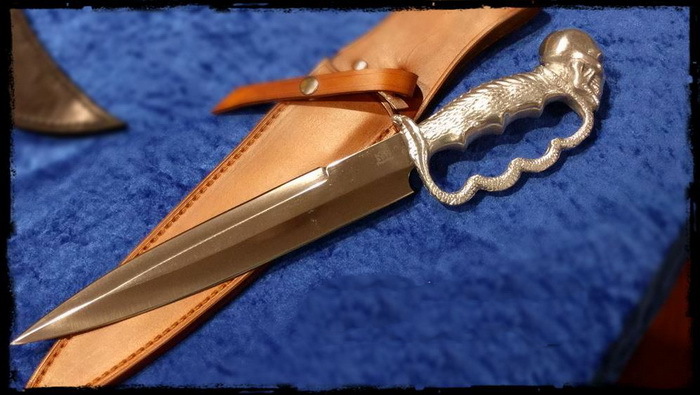 10.5 inch 440C stainless blade with antiqued flats and polished grinds, 15.25 inches overall length. Cast aluminum polished Stone Skull and Cobra grip and to bring the whole package together, it comes with custom Leather sheath. Jumping forward to March 2017, I’m in heavy negotiation for an unissued, in box, smatchet. The deal is made and I am basking in the glow of my soon to be in hand procurement. As I continued to chat with the seller it comes out that he is Bill Stone, son of Eugene Stone who created his old school work of art Stone knives aboard the USS Holland in the Pacific Theater using Mitsubishi seaplane props! Even more exciting than that, Bill tells me he still casts knives. This is huge information and how I didn’t already know this makes me question the fabric of my reality. I want, nay, NEED to make a Stone knife with one of my blades. For weeks I sketched up blade designs and took polls of my friends for the best design, but ultimately I couldn’t choose just one design so my first round of Stone knives, cast by Bill Stone, is 4 knives with 3 different designs all with varied grinds, finishes, textures and style choices.